"In a value-based environment, Oak Street Health is held accountable on how we can quantifiably improve health outcomes. A value-based agreement drives our physicians to develop patient relationships where the goal is helping a patient reach his or her full health potential." LOUISVILLE, Ky.--(BUSINESS WIRE)--For the third year in a row, Humana’s Medicare Advantage program has leveraged the proven impact of its value-based reimbursement model to achieve better health, improved health care quality, and lower costs. Humana Inc. (NYSE: HUM) is the country’s second largest Medicare Advantage health plan provider based on membership. 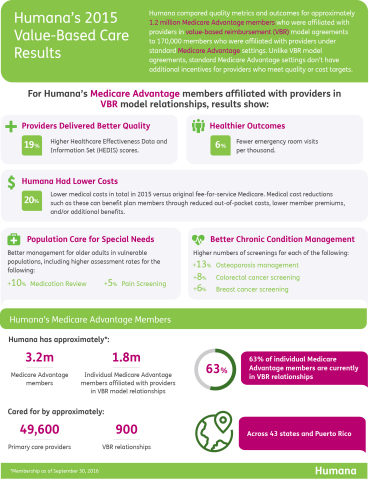 For the calendar year 2015 results, Humana compared quality metrics and outcomes for approximately 1.2 million Medicare Advantage members who were affiliated with providers in value-based reimbursement model agreements to 170,000 members who were affiliated with providers under standard Medicare Advantage settings. Unlike value-based reimbursement model agreements, standard Medicare Advantage settings don’t have additional incentives for providers who meet quality or cost targets. 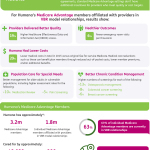 Last November, Humana announced results for its 2014 Medicare Advantage membership. Humana first disclosed 2013 results in December of 2014. 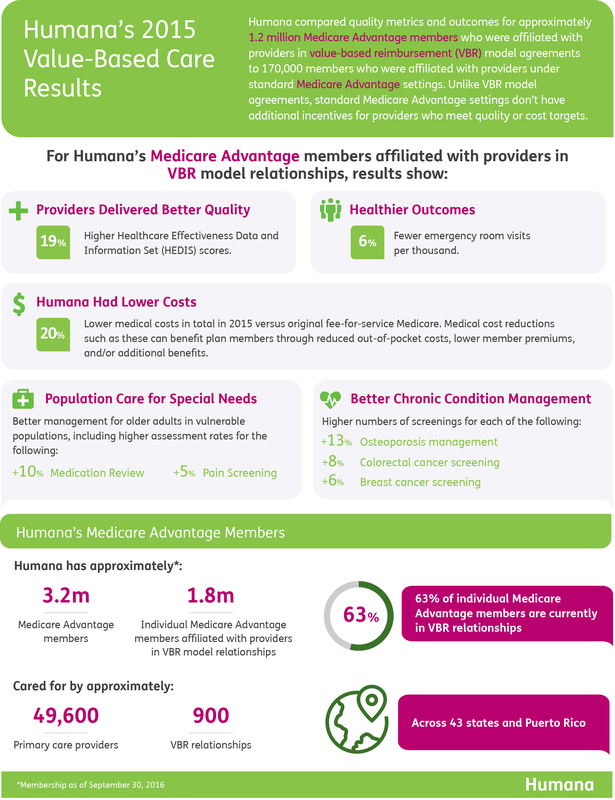 Providers in Value-Based Agreements with Humana Continue to Deliver Better Quality Care: Providers in Humana value-based reimbursement relationships had 19 percent higher Healthcare Effectiveness Data and Information Set (HEDIS) scores as compared to providers in standard Medicare Advantage settings based on an internal attribution method. Members, on Average, Continue to Experience Healthier Outcomes: Humana Medicare Advantage members served by providers in value-based reimbursement model agreements experienced 6 percent fewer emergency room visits than members in standard Medicare Advantage settings. Screening rates were higher for the following: colorectal cancer screening (+8 percent); breast cancer screening (+6 percent); and osteoporosis management (+13 percent). Humana Continues to Lower Costs Through Value-Based Reimbursement Model Agreements: By working differently with providers on quality and health initiatives, Humana experienced 20 percent lower costs in total in 2015 for members who were affiliated with providers in a value-based reimbursement model setting versus an estimation of original fee-for-service Medicare costs using CMS Limited Data Set Files. Medical cost reductions such as these can benefit plan members through reduced out-of-pocket costs, lower member premiums, and/or additional benefits. Humana also achieved better management for older adults in vulnerable populations. For these members with special needs, assessment rates for pain screening and medication review were higher by five and ten percent, respectively. Despite these chronic condition challenges, the 2015 Humana Medicare Advantage members, on average, improved their health and received better quality from physicians, clinicians and other providers in value-based agreements with the company. Humana’s 2015 Medicare Advantage population health results are also in alignment with the Department of Health and Human Services’ goal of moving traditional, or fee-for-service, Medicare payments to quality or value within the next few years. Humana’s value-based reimbursement model for its Medicare Advantage population is guided by the company’s integrated and coordinated health approach: a defined, measurable patient population and pay-for results based on improved clinical outcomes and reduced costs. Humana has 1.8 million individual Medicare Advantage members and 200,000 non-Medicare commercial members today that are cared for by approximately 49,600 primary care physicians, in more than 900 value-based relationships across 43 states and Puerto Rico. As of September 30, 2016, approximately 63 percent of Humana individual Medicare Advantage members are seeing providers who are in value-based payment relationships with Humana. Humana’s total Medicare Advantage membership is approximately 3.2 million members, which includes members affiliated with providers in value-based and standard Medicare Advantage settings. For more information, visit humana.com/valuebasedcare.